The Yankees’ recent record [written 09/26/10] — 4 straight losses, 6-12 in the past three weeks, .529 since the All-Star break — suggests that their third dynasty may be drawing to a close [but not quite, see below]. It would be unsurprising if that turns out to be so. Where are the replacements for Jeter, Posada, Pettitte, and Rivera, whose average age is 38? A-Rod is close behind, at 34, and not the A-Rod of a few years ago. Tex, at 30, is on the cusp of decline, and his numbers show it. Of the younger generation of position players, only Robinson Cano exudes star quality. Curtis Granderson is no Bernie Williams; Nick Swisher, no Paul O’Neill. The only reliable starter is CC Sabathia. A.J. Burnett and Javier Vasquez don’t belong on a championship-calibre team. Phil Hughes isn’t convincing, despite his 17 wins. The bullpen reminds me of a rowboat in a hurricane. Even Mariano has become a question mark. Given the evident dearth of outstanding young players, the end of the present dynasty seems to be in sight — or perhaps visible in the rear-view mirror. The 2009 World Series may have marked the end of Yankees Dynasty III. Dynasty I lasted from 1921, the year of the Yankees’ first AL championship, to 1964, the year of their 29th AL championship. There were some “down” years sprinkled throughout the period — most notably, 1925, the year of the Babe’s big stomach ache, when the Yankees finished seventh in the days of the eight-team league. But the Yankees never went more than four seasons without a pennant, and finished below third (in eight- and ten-team leagues) only twice. Overall record in 44 seasons: 29 league championships and 20 World Series championships. Dynasty II lasted only six seasons: 1976-1981. The Yankees led their division in four of those years, and wound up with the AL crown in 1981, despite an overall fourth-place finish, thanks to the split season (due to a players’ strike) and a post-season playoff to determine the division winner. Overall record in six seasons: 5 division championships, 4 league championships, and 2 World Series championships. Dynasty III (on the current evidence) lasted 16 19 seasons: 1994-2009 2012. Overall record: 14 17 appearances in post-season play, 12 14 division championships, 7 league championships, and 5 World Series championships. (Don’t forget that in 1994 the Yankees had no opportunity to compete for a league or World Series championship because a players’ strike wiped out post-season play.) That’s a lot better than Dynasty II and a lot worse than Dynasty I. 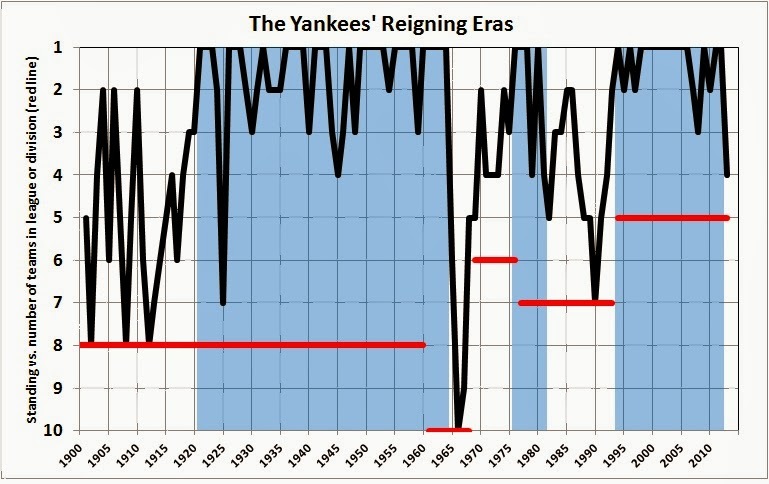 In the following graph [updated to include the 2011-13 seasons], the black line indicates the Yankees’ finishes in the American League (1901-1968) or Eastern Division of the AL (1969-2013). The red, horizontal bars indicate the number of teams in the league or division, for each season. The blue shading highlights the years of the Yankees’ dynasties, to date. It looks like the end for Dynasty III — and end that coincides with the retirements of Mariano Rivera and Andy Pettite, the final declines of Jeter and A-Rod. As the week wears on, the likely voters polled by Rasmussen become less satisfied — or more dissatisfied — with Obama’s performance in office. Irascibility peaks on Saturday, then begins to recede on Sunday. Blue Monday, oddly enough, is Obama’s best day in the eyes of Rasmussen’s survey group. Conversely, the first day of the weekend — a day eagerly anticipated by most working persons — is Obama’s worst day. Go figure. UPDATE: Saturday continues to be Obama’s blue polling day. 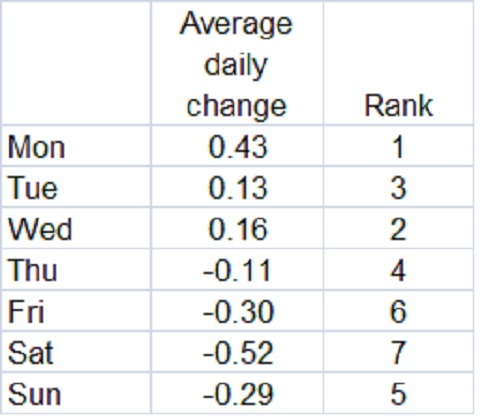 With today’s 2-point drop, Saturday’s average change is now -0.54. Women’s brains are, of course, in many fundamental ways the same as men’s. Men and women think and reason in similar ways. But recent research shows that there are some significant differences in the brain and brain-related psychology of the two sexes. And a few of these differences can make a very large difference with regard to decision-making and its emotional consequences. The part of the brain that processes emotion, generally called the limbic system, of women functions differently than that of men. Women experience emotions largely in relation to other people: what moves women most is relationships. Females are more personal and interpersonal than men. (Differences show up as early as a day after an infant’s birth: newborn baby girls look at faces relatively more than boys, who focus more on moving robotic figures.) There is wide consensus among scientists and researchers on this fundamental issue. Men’s and women’s brains also work differently in handling memory and memories. Men are more apt to recall facts of all kinds, on the one hand, and a global picture of events, on the other. By contrast, women remember people (for example, faces), details of all kinds, and emotion-laden narratives—and they may return to them obsessively. I am only passingly familiar with the research that supports these observations, but they comport well with what I have seen in five decades as an adult. I offer, as just one of many possible examples, my daughter, who — untypically, for a woman — is much better with numbers than with words, and who has succeeded in the male-dominated field of investment banking. She is nevertheless strongly “feminine” in her emotions. Radical feminists and egalitarians to the contrary, women aren’t just men with different anatomical features. There is a good case to be made for the injection of “feminine” traits into the worlds of business and politics. But there is no case to be made for enforced equality of pay or representation. Individuals should be dealt with as individuals, not as “group members.” It is the levelers who are guilty of group bias, given their insistence that males and females are alike in their stock of mental and physical abilities — except that females are superior, of course. T: Hello, uncle, it’s Thomas. S: It’s good to hear your voice, Mr. Jefferson. T: Sorry, not that Thomas. I’m just a humble blogger. Do you know about blogs? S: Oh, yes. I follow all the blogs about politics and economics. It’s quite a chore, but very enlightening. The things some people think about me are shocking. S: Well, there are a lot of people out there who think that I hold the solution to all economic and social problems. S: Of course not. People are responsible for solving their own problems. All I can do is try to create a safe environment in which they can get on with the business of life. T: Before we explore that idea further, tell me about yourself. How did you get your job? S: I was hired by nine of the original States in 1788, when the Constitution was ratified. The other four soon joined them, and others came along later. T: What was your job description when you were hired? S: Pretty much what I said a minute ago: to keep the people safe, which includes refereeing squabbles among the States and ensuring that they don’t erect barriers to keep out people and goods from other States. T: But you seem to have acquired a lot of additional duties since 1788. S: Sad, but true. And it’s wearing me down. I have to pretend to be a lot wiser and more capable than any one person can be. I wish the States would get together and pare my job description down to its original specifications. T: It seems unlikely, though. A lot of people have come to depend on you to do things they could do for themselves. S: And it’s getting very expensive — like having 300 million dependents. The only way I’ll be able to support them all is to raise their taxes. I could borrow money from foreigners, but the more I borrow, the more expensive it will become. Eventually, foreigners will look at my balance sheet and cut me off. T: So what it boils down to is this: In the end, your dependents must pay for the things that you do for them. Correct? S: That’s exactly right. I’m just running a big Ponzi scheme. And most of the people who sign up for it are fools who believe that they’re getting something for nothing. T: What’s in it for you? S: Well, I must admit that I get a cut of the action. T: So, when all the dust settles, your dependents don’t even get all of their money back from you? S: Are you kidding? Of course they don’t. If they want me to do all of this extra work, they have to pay me for my trouble. T: Do you think it’s possible to cut your job back to its original size? S: Only if a lot more people get wise to me. Most of them seem to think I’m Santa Claus or the Tooth Fairy. T: But the politicians who give you your orders don’t believe such things, do they? S: Some of them do. Most of them are just using me to make things work the way they want them to. It’s called “control.” I’ve seen all the presidents, members of Congress, and Supreme Court jutices — from great to mediocre — and almost every one of them was, or is, a control freak. Washington had to be one in order to get things off the ground. Without him, I wouldn’t have a job. Ditto Lincoln, who had to be a control freak in order to save the Union. Not that that was a bad thing, mind you, especially because it brought an end to slavery. But how many presidents since Lincoln have tried to stuff the genie (me) back in the bottle? Cleveland, Coolidge, and Reagan — that’s about it. And whatever success they enjoyed was only temporary. The people are good at fooling themselves, and politicians excel at helping them along. S: I am. What’s needed is another Revolution, but a peaceful one. Those are hard to come by. T: I’ll end our conversation on that note. Thanks very much, Sam. S: Thank you for listening. And give my best wishes to the Tea Party. In the course of preparing the three preceding posts, I compiled the table below. Note that the American League’s overall record is slightly better than the National League’s. That’s because of the AL’s edge in interleague play, which continues into 2010. The members of the Constitutional Convention approved the new Constitution on this day in 1787. The Constitution then went to the old Confederation Congress, which approved the submission of the Constitution to conventions of the States. The Constitution took effect on June 21, 1788, when it was ratified by a ninth State (New Hampshire), though it bound only the nine States that had thus far ratified it. The other four States followed suit, but the Constitution was not ratified by — and did not become binding on — all thirteen States until Rhode Island joined the Union on May 29, 1790. By then, more than a year had passed since the first Congress of the United States had assembled and George Washington had been inaugurated. relates the number of runs a team has scored and surrendered to its actual winning percentage…. There are two ways of calculating Pythagorean Winning Percentage (W%). The more commonly used, and simpler version uses an exponent of 2 in the formula. More accurate versions of the formula use 1.81 or 1.83 as the exponent. Lively Ball Era I was the most dynamic era to date. There were more home runs than in the Deadball era, to be sure, but it is evident that much of the “small ball” action of the Deadball era carried over into Lively Ball I. The Wartime Lull was just that. There were more home runs than in the Deadball era, but every home run netted only 0.52 runs on the scoreboard. Think of batters reaching base and mostly waiting around for a home run to be hit, usually to no avail. The next two eras — Lively Ball II and High Plateau — saw a resurgence of home-run hitting, but run production didn’t return to the level of Lively Ball II. Again, there was a lot of waiting around for home runs, usually to no avail. The era of the Juiced Player rivals (but falls short of) the dynamism of Lively Ball I. 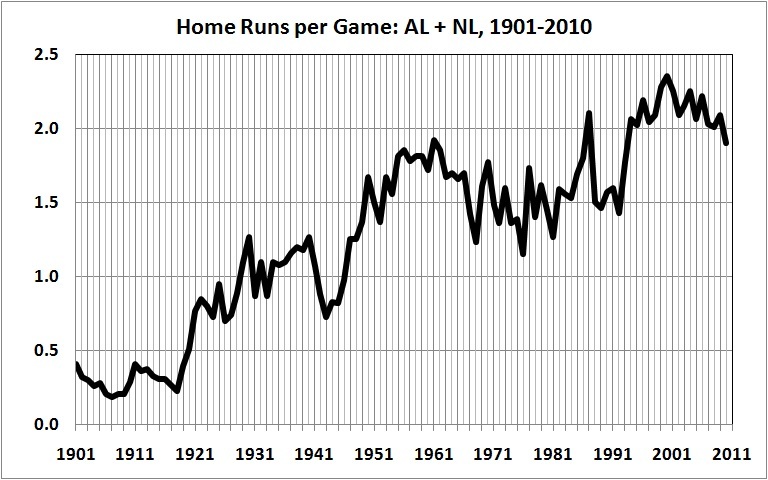 Yes, a lot more home runs per game (what would you expect? ), but not quite the same number of runs per game. I have always had the impression that baseball in the 1920s and 1930s was baseball at its exciting best: power added to the “small ball” wiles of the Deadball era. The numbers seem to confirm that impression. The runs-per-game figures for the “old 16” teams — the franchises in existence from 1901 through 1960 — suggest that those teams have done better than the expansion upstarts. In fact, for the Juiced Player era (1994-2009), the “old 16” have a W-L record of .512. “Old 16” teams occupy the top five spots and 10 of the top 15 spots. But Baltimore (13 straight losing seasons, 1998-2010), Detroit (12 straight losing seasons, 1994-2005), and Pittsburgh (18 straight losing seasons, 1993-2010) have turned in especially embarrassing performances. 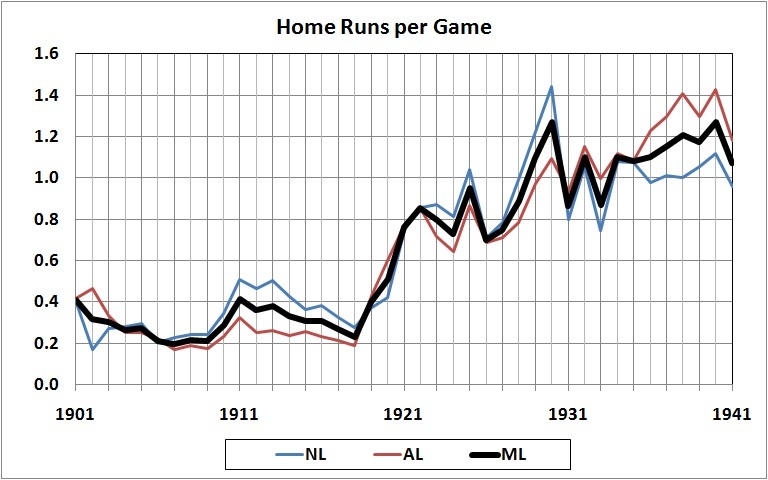 Despite Babe Ruth’s dominance in the early years of the lively ball era — he hit almost 9 percent of ML home runs in 1920, and more than 6 percent in 1927 — it wasn’t until 1931 that the AL began to outslug the NL every year. But there was plenty of slugging to go around, as the peaks and high valleys of 1930-1941 attest. I attribute the higher home-run output of those years to arrival of a new generation of players, who were selected more often than not for their slugging ability and encouraged to cultivate that ability. Following a lull from 1942 through 1946, the home-run barrage resumed in 1947, with the post-war return of slugging veterans and the influx of newcomers raised in the slugging tradition. The second lively ball era peaked in 1961. It subsided with the “era of the pitcher” and the first waves of expansion. But even at its lowest ebb in the 1970s and 1989s, the pace of home-run production exceeded the peaks of the first lively ball era, with only a few exceptions. Then came 1994 and a third era. This one, sad to say, probably owed its existence not to a “juiced” baseball but to “juiced” baseball players. Given the crackdown on performance-enhancing substances, the rate of home-run production in 2010 (to date) has dropped to that of 1961 — when the “juice” in the game came from a performance-inhibiting substance known as alcohol. Estimates for 10,000 B.C. 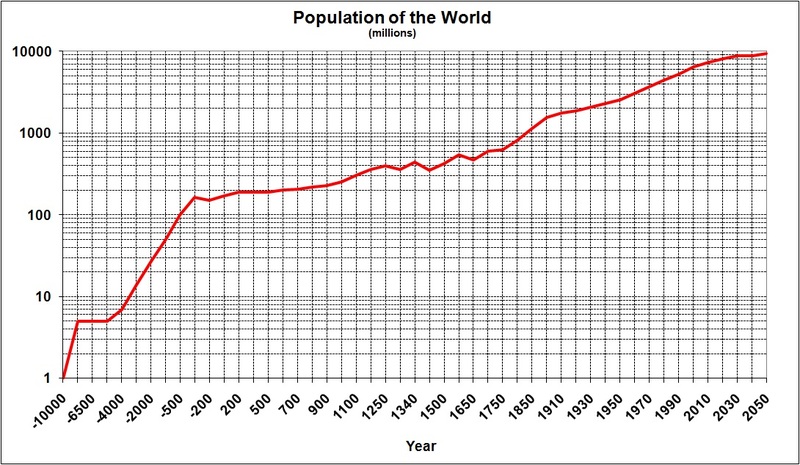 through 1940 derived from U.S. Census Bureau, “Historical Estimates of World Population” (left column). Estimates for 1950 through 2050 derived from U.S. Census Bureau, “Total Midyear Population for the World: 1950-2050.” Intervals between years are irregular because of variations in the intervals in the Census tables. Is it possible that the world’s population will reach an unsustainable level, after which it must shrink and/or plunge the world into abysmal poverty? I will argue at some length that this is too many people to absorb safely, especially since most of the population increase is going to occur in today’s poorest countries. We should be aiming….to stabilize the world’s population at 8 billion by midcentury. Eight billion. I’m not sure where Sachs got that number. And, to be frank, I’m not curious about where he got it…. A … problem with Sachs’s eight-billion number is that, in calculating it, there is no way to predict how human creativity will alter the world during the next 42 years. It’s ludicrous to pretend that we can know now what, say, the average MPG will be for internal-combustion engines in 2050. Hell, we don’t even know if automobiles and lawnmowers and the like will still use such engines then. Will another Norman Borlaug arise, between now and 2050, to spark another green revolution? Will someone invent a way to efficiently power automobiles with air? Will someone develop new and better techniques for defining and enforcing private property rights in ocean-going fish stocks so that the tragedy of the commons called “over-fishing” is eliminated? Will an enterprising entrepreneur invent a means for ordinary households to power their homes with mulch or autumn leaves or small fragments of fingernail clippings? Think back 42 years to 1966. Who in that year imagined personal computers in nearly every home in America? The Internet? Digital cameras? Cell phones? Quality wines sold in screw-top bottles? Buying music with literally the click of a button (and not having to burn fossil fuels in driving to the record store). Aluminum cans that contain only a fraction of the metal that cans contained back then? The Kindle (that will reduce the number of trees cut down to enable people to read books)? Medical advances that make hip-replacements about as routine as getting cavities filled by the dentist? Microfiber? There is no way — literally, no way — to know how technology and social institutions will change between now and 2050. Given this impossibility — and given the fact that we can nevertheless predict with confidence that technology will advance and that social institutions will change — to assert that “optimal” population in the year 2050 will be eight-billion persons is ludicrous in the extreme. It’s faux-science, and deserves only ridicule. I finally got around to reading Matt Ridley’s The Rational Optimist. Highlights…. The Atlantic Ocean is not infinite, but that does not mean you have to worry about bumping into Newfoundland if you row a dingy out of a harbour in Ireland. Some things are finite but vast; some things are infinitely renewable, but very limited. Non-renewable resources such as coal are sufficiently abundant to allow an expansion of both economic activity and population to the point where they can generate sustainable wealth for all the people of the planet without hitting a Malthusian ceiling, and can then hand the baton to some other form of energy. [T]he pessimists are right when they say that, if the world continues as it is, it will end in disaster for humanity. If all transport depends on oil, and oil runs out, then transport will cease. If agriculture continues to depend on irrigation and aquifers are depleted, then starvation will ensue. But notice the conditional: if. The world will not continue as it is. That is the whole point of human progress, the whole message of cultural evolution, the whole import of dynamic change – and the whole thrust of this book…. 5. Declining flu mortality is not dumb luck. [W]hy then did H1N1 flu kill perhaps fifty million people in 1918? Ewald and others think the explanation lies in the trenches of the First World War. So many wounded soldiers, in such crowded conditions, provided a habitat ideally suited to more virulent behaviour by the virus: people could pass on the virus while dying…. The main argument I wish Ridley pursued more: How the very existence of civilization creates a mighty presumption against pessimism in all its forms. But I view his omission optimistically: The arguments for optimism are so numerous that no one book can contain them all. Doomsayers are simple-minded extrapolators. I suspect that they have an aesthetic objection to population growth, which they wrap in pseudo-scientific garb. Like their close kin, anti-market politicians and pundits, doomsayers seem to have no conception of the power of human ingenuity to make life more livable — when that ingenuity is not stifled by government. has appeared in print since at least 1968. Jan Harold Brunvand, professor of English at the University of Utah, introduced the term to the general public in a series of popular books published beginning in 1981. * OPS+ is on-base percentage plus slugging average (OPS) adjusted for where and when a batter compiled his statistics. Statistics derived from the Play Index at Baseball-Reference.com. 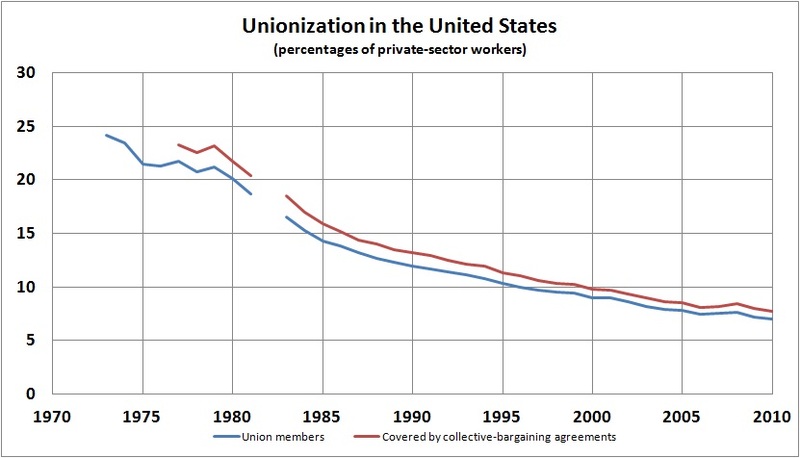 Derived from “Union Membership, Coverage, Density, and Employment Among Private Sector Workers, 1973-2010,” © 2010 by Barry T. Hirsch and David A. Macpherson. On this morning after Barack Obama indulged in the politics of envy and class warfare by rejecting the continuation of the “Bush tax cuts” for high-income individuals, his unpopularity rating fell to a new low: -24. Well, if this morning’s poll results are any indication, there are some well-to-do and aspiring-to-do-well Democrats out there who think Obama would be “doing too much” if he succeeds in raising their marginal tax rates. UPDATE: Despite today’s slight improvement, from -24 to -21, Obama’s unpopularity rating has hit new lows: 28-day average = -17.4; 7-day average = -20.7.